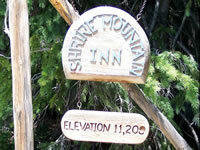 Shrine Mountain Inn is located on 80 acres of private land totally surrounded by National Forest. 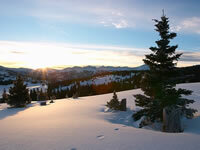 Why this parcel of private land on Shrine Pass exists is not clear. The land was neither a homestead nor a mining claim, but instead, was purchased for cash by the Roosevelt administration in 1904, the year the White River National Forest was formed. Such a transaction was a rare occurance. Legend has it that Roosevelt may have set the land aside with the intention of making it his own personal hunting camp or as a political favor to someone in Washington. Some have also speculated that the land was to be used as a destination for pilgrims coming to view the Mount of the Holy Cross, or perhaps was tied in some way with the old mine site just northwest of the property. Jay Utter purchased the land in 1960 by paying the back taxes. Jay had many dreams of the future of the land. Had he lived, we like to think he would be proud of Jay’s Cabin and the completion of Shrine Mountain Inn. Jay’s good friend, Chuck Anderson, is also remembered by "Chuck’s Place," which was built in his memory. Walter’s Cabin is named in memory of another long-time Vail local, Walter Kirsch. All three loved these mountains, and Jay and Chuck are buried on the property in the Shrine Mountain Cemetery. The present owners, Phoebe Utter Barrett, Chuck and Peggy Malloy, and Chuck and Meredith Ogilby not only have spent more than 35 years in the Vail Valley, but most, including Jay Utter and Chuck Anderson, either shared a background of summers at Lake Geneva, Wisconsin, growing up in Rockford, Illinois, or long years of friendships in Vail. Construction of Jay’s Cabin began in the summer of 1987 and the ground was broken for Chuck’s Cabin the following year. The newest of the three, Walter’s Cabin, was built in 1997. All cabins were constructed from logs timbered near Eagle in the Brush Creek area and from the flattops north of Glenwood Springs. While Shrine Mountain Inn is privately owned and operated, all scheduling and reservations are handled by the 10th Mountain Division Hut Association (TMDHA) of which it is part. Based in Aspen, Colorado, TMDHA is a non-profit organization that manages a system of 29 backcountry huts throughout the state, which are connected by over 350 miles of trails. They provide a unique opportunity for extensive backcountry skiing, snowshoeing, hiking, mountain biking, and snowboarding while staying in a safe, comfortable shelter. TMDHA is named in honor of the soldiers of the 10th Mountain Division of the US Army, who trained during World War II at Camp Hale near Shrine Mountain Inn. Visitors to Shrine Mountain Inn and the other huts share in the spirit of these individuals, especially their pursuit of excellence, self-reliance, and love of the outdoors.